Welcome to anther Tech Tuesday edition of Chris’s Corner, presented by Imagine! 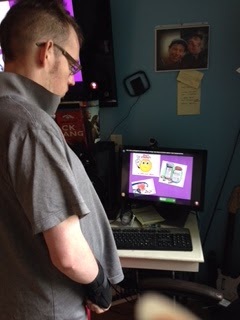 Assistive Technology Specialist Chris Baumgart. 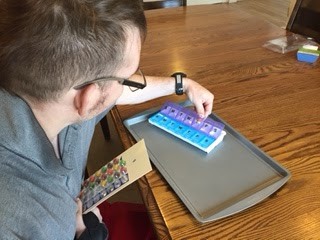 Today, Chris provides an update on residents of Imagine!’s Bob and Judy Charles SmartHome and their use of a new computer-based medication task minder developed by Imagine! staff members called MedMinder. In this installment of The Corner takes us back to the Bob and Judy Charles SmartHome in Boulder, where residents are taking control. 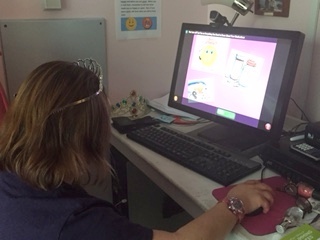 Back in December, we showed you a video of Lana using a prompting system to fill her own Medication Reminder Box. 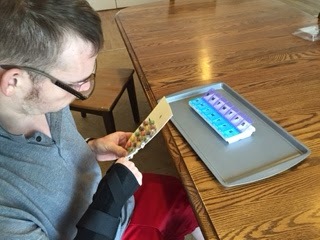 In addition, two other residents, John and Karen, had decided to follow in her example and become more independent with their medications as well. But wait, the momentum keeps on building! Now, in addition to Lana, John, and Karen jumping on the medication self-reliance train, Rae, Rebecca, and Chris have hopped on board as well. Pictured below you see each of them taking practice tests to review everything they need to know about their medications, as well as practicing the act of filling a Medication Reminder Box. 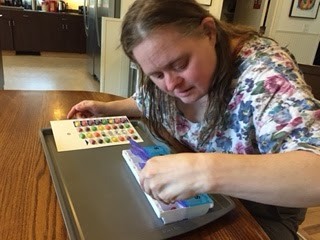 Not only have the residents expressed how much they enjoy having more control over their medications, but the benefits for the residential staff have been observed as well. 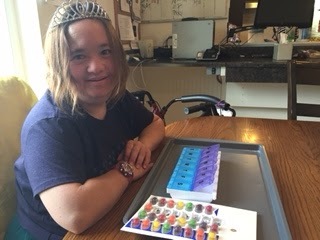 According to Shannon Bundy, the Site Supervisor at the Bob and Judy Charles SmartHome, the fact that three of the residents are now self-reliant with their medications has reduced staff workload by as much as an hour per day, which really adds up. Now they’re on track to see another three clients become medication self-reliant as well! Exciting times over there, everyone! Keep up the great work! And check back with us soon, Corner-ians! We’ve got more updates coming! Under normal circumstances, shampooing would probably be preferred to washing the seat, unless you're talking about vinyl seats.